Today is the 20th anniversary of the Oklahoma City bombing, for which Timothy McVeigh was executed in June, 2001. Some of you undoubtedly are watching the McVeigh Tapes tonight on MSNBC. 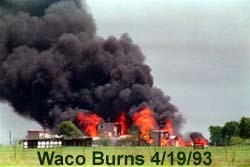 They will have a computer generated character, who in their view bears a physical resemblance to Timothy McVeigh, so you have something to look at as they play the audio of tapes made during interviews he granted to the two reporters who wrote the book, American Terrorist. Since I was one of McVeigh's trial lawyers, I obviously have my own opinions about why he chose to speak to the reporters and what his objectives were -- and how much of what he told them was accurate. 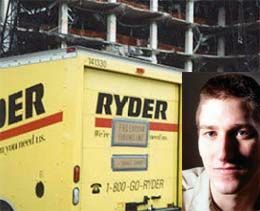 Ten years ago today, a Denver federal jury returned a death verdict against Timothy McVeigh for the Oklahoma City bombing. A few weeks ago I sat down with Colorado 850 KOA News Radio host Steffan Tubbs for an interview about what it was like to defend McVeigh. Tubbs also interviewed Houston lawyer Chris Tritico, another principal member of the trial team . The interview aired today as part of a five part series that looks back at the trial. 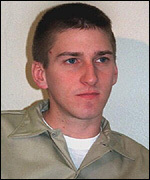 McVeigh was executed by lethal injection six years ago on June 11, 2001. What is like to defend the most hated man in America? Would I do it again? You can listen here. Other parts of the series which include interviews with the prosecutors, victims' families, members of the media and a juror are here.